One of the most common HCG side effects is constipation. Constipation on HCG is more common than most people realize. If you have a tendency toward constipation, HCG will be more likely to make it happen. Constipation may even occur regardless of whether you have had this problem before. Here is what happens and what you can do about it. In this case, constipation means not having a bowel movement for more than three days. If you are expecting to lose a pound per day, almost all of your weight loss is stuck inside you when you are constipated. 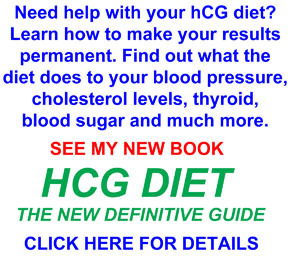 You much have one or more bowel movements per day to stay on track for weight loss on HCG. Several natural (i.e., non-laxative) strategies can be very helpful. The simplest and easiest one is to increase your water intake. Eight glasses of water per day can be miraculous in many ways, including preventing constipation. It is also simple and easy to drink a daily glass of water with a spoonful of psyllium. This is the active ingredient of Metamucil, although psyllium itself does not contain sugar or artificial sweetener or any of the other useless ingredients that are in Metamucil (filler, food coloring, flavoring). Psyllium should be available in any supplement store. It is also a whole lot cheaper than Metamucil. Herbal teas are the final natural strategy before you consider the synthetic laxatives. Some herbs are, indeed, natural laxatives themselves. These include Cascara Sagrada and senna. One or both of these are often the main active herbs in dieters’ teas. These are widely available in the tea section of grocery stores and supplement stores. Licorice tea may also be helpful. One more thing that is of great benefit in many ways, including preventing constipation, is an ordinary magnesium supplement. Almost everyone is deficient in magnesium, which causes long term problems in how your body uses calcium properly. A one-time dose of 400-500 mg of magnesium (for example, as magnesium citrate) can really loosen you up. In fact, the first time I took this amount of magnesium in a single dose, I got the runs. Sorry for the visual on this. However, it makes my point, doesn’t it?